It's official now: we will have fun races and a freestyle competition at Kalmus Beach on September 14-15 at Kalmus Beach in Hyannis. It will be modeled after the very successful East Coast Windsurfing Festival in Long Island. The primary focus of the event is to have fun with windsurfing friends on the water. I'll never forget the first time I raced at the ECWF Long Island in 2011. Rounding a buoy in light wind in a crowd, I was about to fall when I suddenly felt a helping hand in my back that kept me on the board. This really characterizes the spirit of the ECWF, and we hope to re-create it on Cape Cod. If you'd like to read more about past ECWF events, check out the Blogs section on http://www.ecwindfest.org/. The web site is still work in progress, but you can also find pictures and videos from past events. Races and freestyle heats will be intermingled to allow competitors to compete in both events. If we have enough competitors, we will have an unlimited and a 7.5 m racing class, and a "pro" and "amateur" freestyle division. We hope to have at least as much fun as at the Buzzard's Bay Crossing last May! 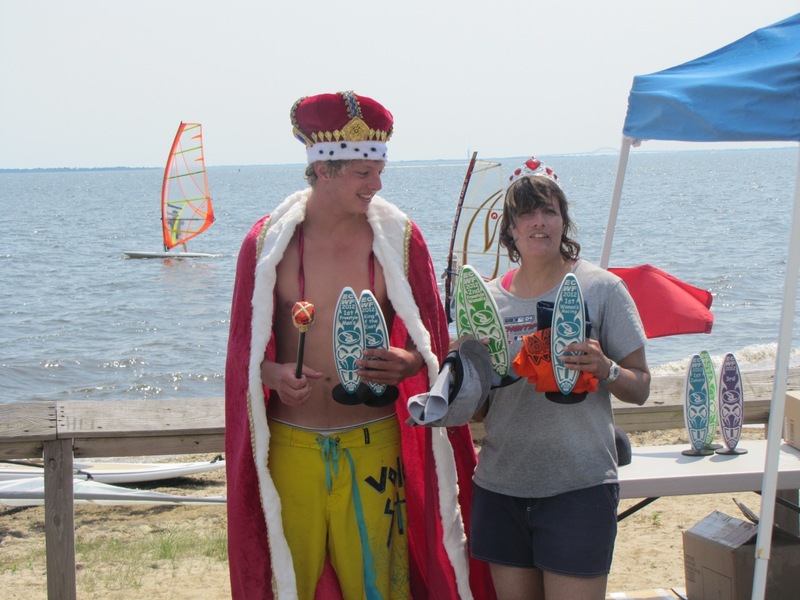 Registration for the East Coast Windsurfing Festival Cape Cod is now open at http://www.ecwindfest.org/register.php. We also have had great feedback from the first potential industry sponsors - it looks like we will have a brand new sail, high performance fin(s), T-shirts, and more for the raffle! So register now and join the fun! The registration fee of $20 for one or both events (racing and freestyle) is due when signing in at the event. Looks like we'll get a decent crowd and some high level freestyle competition, with 13 registrations already, including the King and Queen of the East from last year's ECWF. We might just have to crown a King and Queen of the Cape! We also now have a Facebook event page for easy signups. be careful you don;t have to pay royalties. king of the cape might still be a registered brand name! "King of the Cape" was never a registered trademark or service mark in the US. It was, however, a great event, and its death led to the creation of the East Coast Windsurfing Festival in Long Island a few years later. In turn, the fun we had there in the last two years made us want to create a similar event on Cape Cod again. We hope to make this an annual event. With 20 registrations on the first day, and support from 3 new sponsors who will donate a sail, fins, and T shirts for the raffle, things are looking good! kewl, as US775 used to say. i was really just kidding, but you have obviously done your homework. And most of the work is actually done by the lovely Nina, with help from Dani, Mike, and Phil. They are doing an excellent job, I might add - we have 31 registered so far, and a whole bunch of companies have said they'll sponsor: Inland Sea, Windsurfdeal.com/KA, Vector Fins, Maui Ultra Fins, Ianovated, Makani, and NoLimitz. In ECWF tradition, instead of prizes for the winners (other than Jerry's excellent trophies), we'll have a raffle for all participants. Looks like we'll have quite interesting giveaways: a sail, a winter wetsuit, fins from at least 3 top manufacturers, T shirts, and more. I can't wait for this one! I finally get to race instead of sit at the judges booth If you guys haven't been to the event on Long Island that this event is based off of, all I can say is you are missing out big time. It's VERY laid back, yet run very smooth. the lower the wind, the more fun we have! Fierce racing turns into incredible laughter the entire way around the course. Seriously, I was able to get out of the judges booth and do one race last year on my SUP and laughed the entire way from the start, to the finish and everywhere in between. Sure you'll have some incredible sailors putting on a show, but there there will be even more there just to have fun. If it does blow, the level of sailing will be something to see. And for me getting to mingle with that many windsurfers in one spot is one of the best parts.